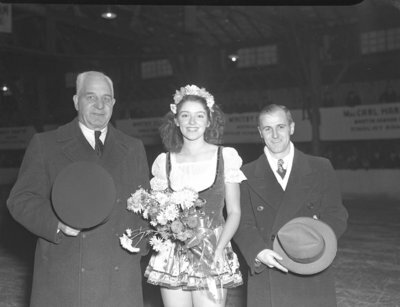 Black and white negative showing senior champion Marilyn Take with flowers following the Ladies' Skating Championship. Police Chief William John Elliott is at left and Donald Gaine is pictured at right. Ladies' Skating Champion, 1948, Marjorie Ruddy, Whitby Archives, 21-020-001.